Apparently, I learned much later, the Irish hate this. Whoops! The United States is a country of immigrants, and most of us lack a truly long family history here. So we cling proudly to the heritage of our ancestors. I think we’re subconsciously trying to anchor ourselves to places with more history & culture than our own young country has. While I may not have been born in Ireland like my new drinking buddies, I was just trying to start a conversation and find a way to relate. However now, after a bit of work, it’s official. I’m truly an Irish citizen! How did that happen you ask? Well, I became an Irish Citizen by descent, and if you have Irish parents or grandparents, you can too. The result is a 2nd (EU!) passport, and all the benefits that entails. There’s something like 40 million people living with Irish heritage in the United States. I’m guessing many of them don’t realize they might be eligible to become Irish citizens. From 1820 to 1860, almost 2 million Irish immigrants made their way to America looking for a better life, and this mass migration has created a unique opportunity for Americans looking to gain Irish citizenship. While most countries allow people to claim citizenship if their parents came from the country, Ireland goes several steps further. Under the Irish Nationality and Citizenship Act of 1956, people born outside Ireland can claim citizenship, if their parents were born in Ireland, but ALSO if a grandparent was born there. So if you’re an American (or any nationality really) with an Irish grandparent, you have the right to claim Irish citizenship under this law. This was my case. My Grandmother on my Father’s side was born in Ireland, and immigrated to New York in 1930. In some rare cases, a great-grandparent will work as well. But only if your parent applied for their own FBR (foreign birth registration) before you were born. If your parents are Irish, you are automatically entitled to citizenship. But if you’re applying because a grandparent came from Ireland, you have to establish proof of lineage with documentation. I’ve covered the basics below, but for official instructions from the Irish Embassy, click here. (3) ORIGINAL documents showing Proof of Current Residence (utility bills, bank statements, lease) You don’t need to live in Ireland. Collecting all these original documents requires the most work out of this entire process. You may have to track down relatives who have them, or order new ones from the proper officials. For me, locating an ORIGINAL Birth Certificate for my deceased Grandmother was the most difficult part. Because she never had one! During the early 1900’s, many children in Ireland never received official birth certificates, especially in more rural areas. Because doing so required traveling to the nearest big city. Instead, local churches recorded births with Baptismal Certificates. My Grandmother was one of these, being born in a small coastal village to a family of fishermen. In this instance, you can still apply for citizenship, but you must first search for your grandparent’s birth certificate through the General Registrar’s Office anyway. You’ll receive a letter back saying they couldn’t find it. Finally, forward this “we can’t find one” letter along with an original copy of the church baptismal certificate (with church stamp) when you send in your application and all your documents. Once you have all your lineage documents ready, fill out the online citizenship application. When finished, the application is submitted to the Irish government electronically. You’ll also get a PDF version that you must print out and sign, which will be mailed in with all those documents you collected earlier. You’ll need a legal witness to help you complete the whole application process. They must fill out Section E of the application, sign your passport photos, witness you sign the application, and provide their professional contact information (business card) for follow up later. In my case, a police officer who’s a family friend acted as my legal witness. However your primary care physician or local bank manager should be easy to convince too. It’s not too difficult. It just can’t be a family member. This can be a bit nerve-wracking. You’re going to mail a bunch of personal, sensitive, original documents overseas to Dublin. I recommend sending everything via FedEx, with tracking, just to be safe. It’s not cheap, but you don’t want that stuff getting lost in the mail! Don’t worry, once the whole citizenship process is complete, the Irish Government will send all those precious original documents back to you. 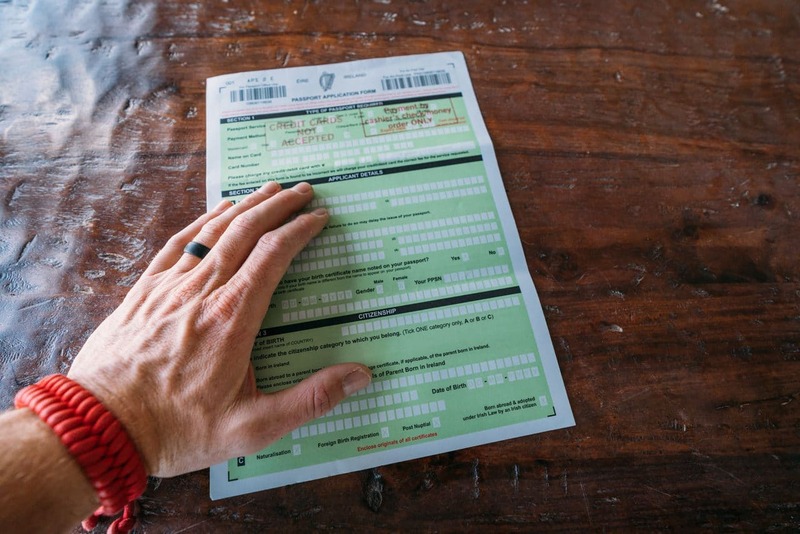 Once your Irish citizenship application is approved, you’ll eventually receive an official Irish Foreign Birth Registration (FBR) in the mail. Congratulations, you’re Irish! Go have a Guinness to celebrate! You’ll need your new Foreign Birth Registration document to apply for an Irish Passport, which is a separate step. The actual Irish passport application must be mailed to you from the nearest Irish consulate (you can’t download them online). Fill out the passport application. Have a legal witness watch you sign it. After first applying for Irish Citizenship, I received my Foreign Birth Registration document in the mail 5 months later. This was even after I was asked to fix part of the application (it needed a more recent signature). Most reports online say it takes 5-6 months for this step. Once I applied for my Irish Passport, it was an additional 4 months before that showed up at my door. So the total process from start to finish took about 9 months, not including the time needed to track down any required family documents, like original birth/death/marriage certificates. Ireland is not the only country with an ancestry law like this. While it may be one of the easiest 2nd citizenships to obtain — Italy, Spain, and Portugal have similar laws on the books. So if you have grandparents from any of those countries, I’d recommend doing more research and look into the requirements. You may still have a chance of snagging an elusive and coveted EU passport! 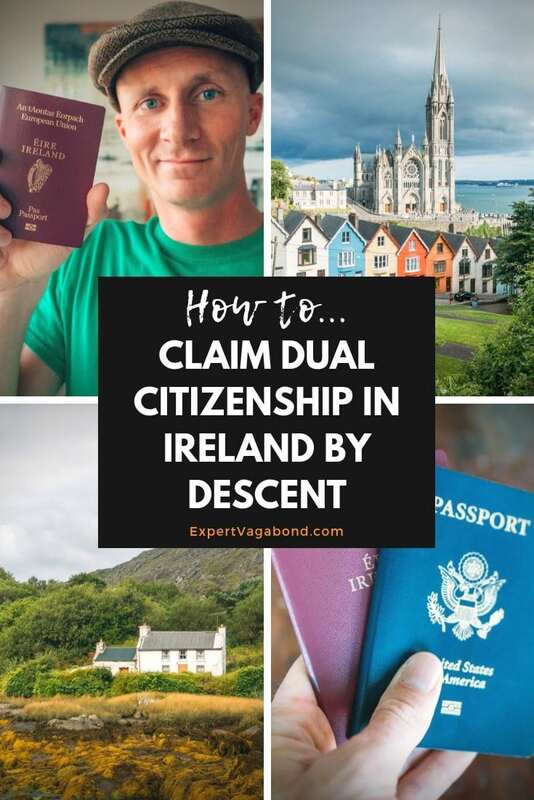 Just keep in mind that some countries do not allow DUAL citizenship like Ireland does, meaning that while you may be able to become a citizen of another country through ancestry, you might be required to give up your American citizenship in return. So why go through all this trouble to obtain a 2nd citizenship? Is having two passports even legal? These are questions I’ve been asked a few times now. Yes, owning two passports is legal in most countries, including Ireland & the United States. However it depends on the country. Dual citizenship has always been a dream of mine, mainly because it opens up your options. I mean, who doesn’t want more opportunities in life? It gives you additional freedom for travel and international living. The Republic of Ireland is a member of the European Union, and under EU rules, anybody with citizenship in one country is allowed to visit, settle, and work in other EU countries, without restrictions. Ireland has a long, relatively peaceful history. 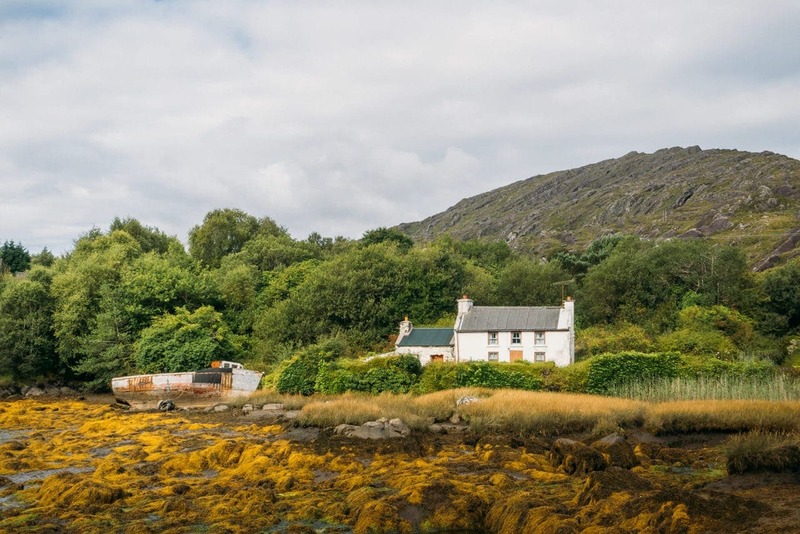 It remained neutral during the world wars, keeps out of global politics, and is one of the most relaxed places to live, should I ever choose to move there. It has cheap universal health care (along with other EU countries), no mandatory military service, some of the lowest corporate tax laws in Europe, a friendly population, and a beautiful countryside. Generally I try to keep this blog free of politics. But after the election of Trump, the Brexit vote, and a rising trend of nationalism worldwide, I don’t mind admitting that it’s nice to have the option of living in the EU. I’m not the only one taking advantage of this Irish law. There’s about 10 million non-resident Irish passport holders out there. More people than ever are applying for Irish Citizenship too, especially after what’s been happening in the United States and the United Kingdom. Yeah, I have two passports. Just like Jason Bourne and James Bond. How fun is that!? Where do I sign-up for my secret agent watch & Aston Martin DB5? I’m proud of my Irish heritage too. 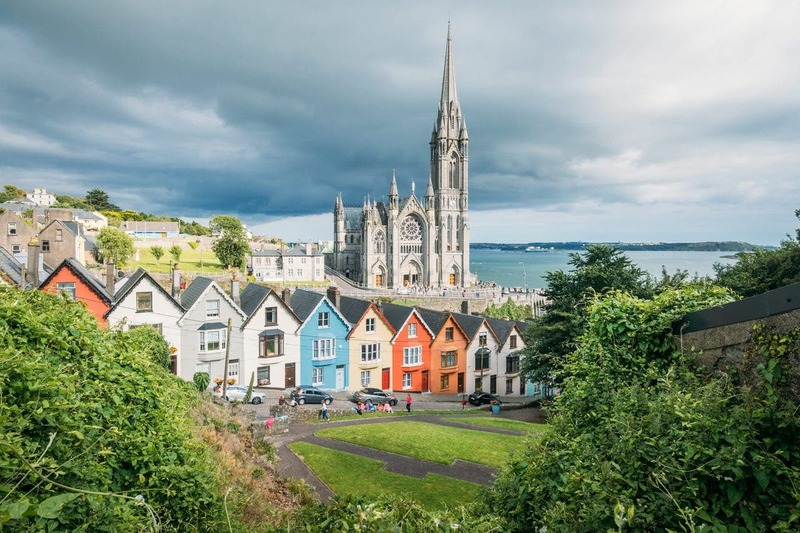 Ireland is an amazing country, with fun traditions and a fascinating history. My family and I had a wonderful time tracing our roots in County Cork & visiting my grandmother’s old house. As an Irish citizen, I can pass this privilege on down to my (possible future) kids one day, and they can pass it on to their kids. Who knows what our world will look like then. Dual citizenship also helps me get one step closer to becoming a Citizen Of The World, someone who thinks & acts beyond borders. True freedom. As a professional traveler, having the option to travel on two different passports has perks. Irish citizens get visa-free access to 175 countries, and Ireland’s passport is one of the most powerful in the world. For example, it’s easier to visit some countries (Cuba, Iran, Bolivia) as an Irish citizen than it is as an American citizen. Basically, dual citizenship from Ireland has some pretty unique benefits. Many people spend years and tens of thousands of dollars trying to become EU citizens, so if you have the privileged option to do it in 9 months for $700, I highly recommend you take advantage of the opportunity! 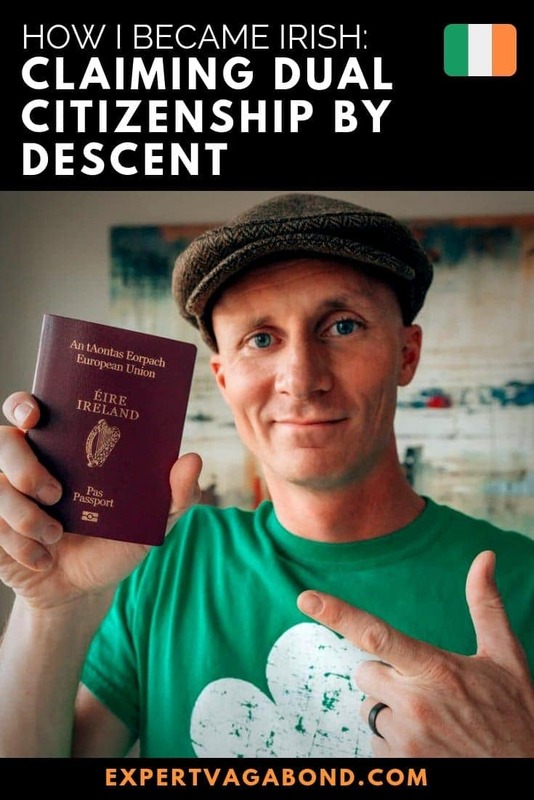 Any questions about obtaining Irish citizenship by descent? What’s your opinion of dual citizenship? Drop me a message in the comments below! So my fathers – fathers came from Ireland. If I can get all the documents and have my father apply for dual citizenship can I then have it passed down to me. Do you have to pay and taxes or anything like that Goni g forward each year ? Quick question – when you say the FBR certificate arrived in the mail, was that regular mail, registered mail, or courier? Also, was there any email from them to notify you that the application was approved and that documents were being returned? Is this the same for Co Down, technically a part of the UK? My maternal grandfather was born in Co Down in 1879. Yes, anywhere on the Island of Ireland is in scope for the Grandparent rule. I have three passports, Irish, British and Canadian! I agree that all these certificates are best sent by Fedex, but does anyone know the street address? The form just says “Foreign Births Registration Section, PO BOX 13003, Balbriggan” and Fedex demand a full street address. Current children: only if one of YOUR parents (their grandparents) was born in Ireland. If you are obtaining your Irish citizenship through a grandparent (great-grandparent for your children), then the “great grandparent” rules apply for them. Your current children wouldn’t be able to get it because you didn’t have your own FBR (Irish Citizenship) before they were born. If that makes sense. I am trying to pull together the records for my grandmother at the moment. I have her marriage certificate and think I have found her birth record in the register of births for her region. My question/issue is that she was brought up by nuns and wouldn’t talk much about her past. The birth record does not give a father and states that her mother was in the workhouse. The registry date of her birth is a couple of weeks after her birthday and broadly matches for the age on her death certificate (98). However, her age on her marriage certificate is wrong and she gives the name and occupation of her father (understandable given the nature and place of her birth). My concern is that the details of these documents not matching could cause issues with the process. I value your thoughts and experience. 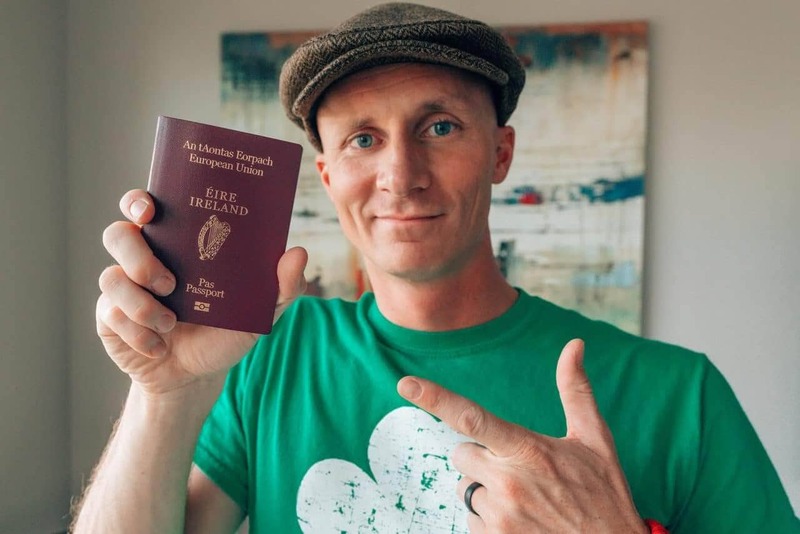 Will having an Irish passport do away with the need to the 2021 US Citizen visa requirement? My mother was born in Ireland so I may just have to get my Irish passport. Yes. You wouldn’t need a visa to enter the EU, because you would be an EU citizen. Thanks a lot for this info, so much easier than the Irish website’s info. My grandfather born Ireland 1902, he’s the father of my mum born UK 1941, I’m guessing that I only need birth, death, marriage and divorce certs for them and not for my Welsh grandmother or for my Scottish father… does that sound right? I was very interested to read your article. I have a few questions as to the benefits of having an Irish passport as an American, which I have through my Irish grandmother. Is it true that you cannot use your Irish passport to travel from USA to EU or the other way? Can I apply for national health insurance when I spend three months of every year in France. I have a Franch bank account, credit card and the same apartment that I rent each year. Can you tell me what other benefits you have found having an Irish passport? Just received my great grandmother’s birth certificate from Ireland in 1871. Or is that too far removed? Would a great grandmother work for applying for dual citizenship? You opinion is appreciated. You say to mail everything to Ireland. Where exactly do I send them? Do you have a specific address? Great to see this was successful for you! I am in the process of completing this process on behalf of my dad as a gift. Wondering if you claimed citizenship through both grandparents or just 1? If both, do you know of others who have only claimed FBR through 1 grandparent? Thanks! Thanks! Yes I claimed citizenship through a single grandparent. Hi Matthew, Congratulations. It is cool, right. I have had double nationality since 2005, I was borned in Venezuela but my father was borned in Spain. Since november 2017 I live in Spain but I traveled 4 times to the US with the spanish passaport and had no problem at all since I can enter withouth a visa for 3 months. Once in Europe you have free transit from one contry to the other, I live in Spain and for now my work is in Portugal, I live near the border so I cross it twice a week now but at first was 6 days a week. My goal it´s to live in Ingland or Ireland hopefully soon, but still waiting what´s gonna happen with the Bretxit. So, enjoy it, it is the best gift from our parents and grandparents. Brexit is such a clusterf*ck. Who knows what will happen. Glad you have dual citizenship too! It really opens up some options and is quite a privilege. We are very lucky. Did your grandmother apply for naturalization after moving to the States? My grandparents did and I’m trying to figure out if that means they Made a ‘Declaration Of Alienage’ and if that will prevent me from becoming an Irish citizen by descent. Hi , All four of my Irish grandparents arrived in the USA late 1890s & early 1900s. All applied and was granted American citizenship. My grandparents happily denounce their British citizenship and Queen Victoria. At that time Ireland was under Britain. If you research your grandparents “ Rquest or Declaration for USA Nationalization Documents” you will find what county was denounced. If by chance they denounce Ireland do not despair, contact the Irish Embassy or visit The Irish Foreign Birth Web Site. I did see verbiage concerning this subject with instructions on how to proceed. Obtaining Irish Citizenship and Passport is a well worth challenge , just remember to dot every i and follow the instructions to the letter. All questions should be submitted and directed by email to Ireland’s Department of Foreign Births. Irish Embassys will not answer questions concerning citizenship but will assist with Irish Passports. Good Luck. Can you provide me with an agency where I can apply for all my grandmothers original certificates. I tried a few agencies online and they won’t allow me to purchase them for some reason. My grandmother was born in Ireland and married and died in NY. Our family no longer has her records. I only have the information on ancestry. I’m 90% Irish via my DNA and would love to move back to my roots in Ireland. India has somewhat similar program. If your parents or grand parents were Indian, you can get OCI (overseas Indian), it’s like eternal visa, the only thing you can’t vote. It’s not a citizenship though! as India doesn’t allow dual citizenships. It’s rather easy way to live if you travel to India often or work here (no need employment visa). My Mauritius friend just got OCI and super happy about that. Do you know if I have my maiden name back…if I still need marriage/divorce records? I also had to get a copy of my grandfathers renunciation of irish citizenship. Kudos to you for your success in becoming an Irish citizen. I wish there were more “citizenship by descent” programs at least that would qualify me. I believe most of my family is of African descent, but I haven’t heard of any “citizenship by descent” programs there. My great-grandmother is half Portuguese and half Cuban, but I’m not sure if her Portuguese ancestors were from Brazil, Portugal, or an African nation. Recently, I ordered a 23andMe test to find out, but I don’t know if I could use that document to qualify for citizenship. In the meantime, I’m living in Mexico and will be a permanent resident in three years when I renew my visa in September. So, that’s my backup plan. Like yourself, I avoid talking about politics, but history has shown that countries change for the better or worse within a few years or few decades. So, having another option like permanent residency or a second citizenship is a good decision to add more opportunity and security to your life. Hi, that is brilliant. Welcome to the EU! I am a British Citizen and ahead of Barmy Brexit, I heard tell that it is possible to gain Citizenship (not a passport) of another EU State, which might make life easier crossing borders if Britain does leave (I still entertain the vain hope that it doesn’t! Do you know anything about this? I would be most interested if you or any of your readers could cast any light. I am of Irish descent, but only via Great Grandparents. Not sure if this would qualify me for a second passport! Hi Jackie, with citizenship you can apply for a passport too. However, I believe the only way great grandparents work is if your parents applied for their own FBR before you were born. Welcome to the crazy world that is being Irish, Matthew! Congratulations on your new citizenship. Your post is very detailed and will be of immense use for people in the same situation. Living in Ireland is not as easy as one thinks (our public healthcare system is the biggest bone of contention) but, as you correctly pointed out, carrying an Irish passport has great benefits for travellers. I’ve got to say “hats off to you” for all this detail. I am a “Brexit Irishman” who has followed a similar process to get my Irish passport. The Irish do not like outsiders – even those who emigrated and returned – who claim their heritage makes them like them. So I’m don’t see myself as Irish but “of the diaspora”. And this is fully recognized as a basis for citizenship. The national anthem refers to “some have come, from a land across the sea” and references American and British born Irish revolutionaries from 1916-22. On that basis, although I don’t claim to understand what it means to live in Ireland today, I can proudly claim that we are comrades from a land across the sea on the global Irish diaspora. As your countryman and mine (Tom Paine) said: “the world is my country, to do good is my religion”. Slainte. Very true, and I feel the same. I can’t understand what it’s like to be Irish just because I have a passport — having never actually lived in the country. You are so lucky! Gives you so many options. Congratulations! The Department of State is responsible for determining the nationality status of a person located outside the United States or in connection with the application for a U.S. passport while in the United States. Section 101(a)(22) of the Immigration and Nationality Act (INA) states that “the term ‘national of the United States’ means (A) a citizen of the United States, or (B) a person who, though not a citizen of the United States, owes permanent allegiance to the United States.” Therefore, U.S. citizens are also U.S. nationals. Non-citizen nationality status refers only to individuals who were born either in American Samoa or on Swains Island to parents who are not citizens of the United States. I really don’t want to lose my USA citizenship but I’m hoping to gain dual citizenship and retire in Ireland someday. Do you know anything about having to give up your USA citizenship? I saw the conflicting statements on the US State Dept website under “advice about dual citizenship”. thanks in advance for any help you can give. Congrats and Slainte! Hi! Great article. One question: The U.S. usually does not allow for “dual citizenship” except in instances of birth. The US immigration site says that if a US citizen “applies” for dual citizenship, it could put their US citizenship “at risk.” Is this “application” as Irish citizen by descendency considered an “instance of birth”? I recently got my Irish citizenship from the Foreign Birth Registry. It took four months from when I mailed all the documents in. I recently sent everything in to get my passport. They said that takes fourteen weeks. The Consulate General office actually called my witness to ask if he knew me and for how long. No one had asked my witness for the initial citizenship process. So I would be careful just having a stranger notarize everything in case they check! Do you know if I travel to Ireland for two months with someone who doesn’t have an Irish passport, should I not use mine? Even though Americans can stay three months, I read that they are questioning non citizens more about longer stays. Just curious! So the thing with dual citizenship is that you should always enter a country by showing that country’s passport. You can book your ticket any way you want, you just need to bring both passports with you so you can show gate agents or immigration officials the one that allows you to be there legally. So I’d enter and leave the EU on the EU passport even if your airline ticket was booked using your US passport details. If the airline gate agent in the US asks to see proof of a return ticket, you can just show them your EU passport as proof you don’t need one. Then, use your EU passport to enter Ireland. When returning to the US, show your US passport. If that makes sense? Interesting process. Thank you for the information. My wife is Irish, I will have her look into this option. Awesome story! I’ve been dying to do this but with Spanish citizenship. Both of my great grand parents were born in Spain but my grandparents were born in Cuba. The process has consequently been more dicey than I had initially bargained for so I’m putting a pin in the whole dual citizenship thing. Glad it worked out for you though! Congrats! 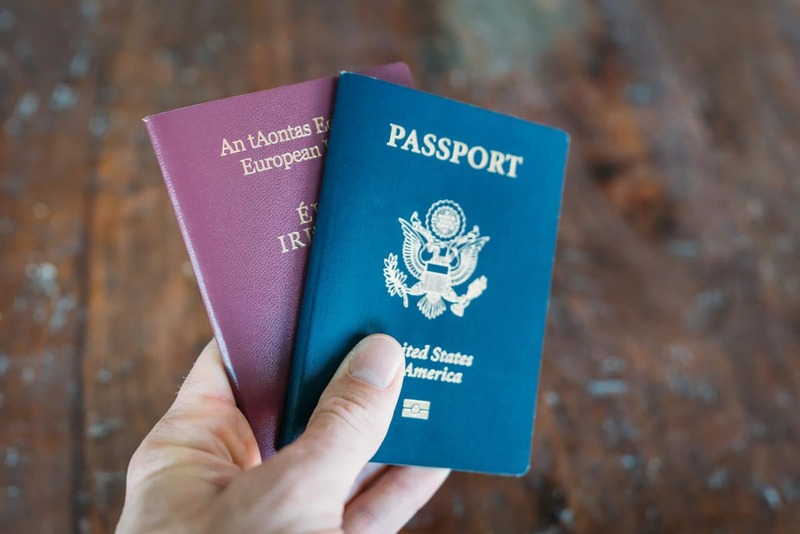 Having dual citizenship is very helpful and a great way to stay connected to your heritage. I have Swiss citizenship through my mom (she was born in Switzerland) and was able to live and work in England for a year thanks to it. What about visiting Cuba for ex.? Can you leave US with US passport and enter Cuba with Irish passport (if you take direct flight)? Cuba is slightly tricky. As a US citizen you always need to leave and enter the US using your US passport. While you can enter Cuba using your other passport, as your flight leaves directly from the US you still need to prove the purpose of your visit to Cuba for Americans. If you want to avoid issues, simply fly via Mexico. Then, you’d just have to use your US passport to fly to Mexico. Amazing! :D Glad it worked out for you! Hey, found your blog really great and informative. I’m in the middle of getting my Irish citizenship too actually. I wanted to give you an update though. Your witness step, I did actually confirm through email with an FBR consular that we can simply use a notary public who is unaffiliated with us or anyone we know. I mention this because I had the issue of not being able to come up with anyone on the witness list through myself or family/friends. I also couldn’t find any info about it online, but eventually did get confirmation from the consular in Ireland about it. Oh, great to know Aaron! Thanks for the update. I did the samething I got my British Passport through decent. I also have two passports U.S and Uk. It actually took me about 3 months to get my passport. Congratulations on becoming a citizen of Erie. Both my paternal grandparents and my mother emigrated from Ireland and became American citizen. I know little about either grandparents, expect Patrick came from County Mayo and Mary from County Sligo. My mother, Winifred, also came from County Mayo. She spent time in London to earn money for the passage, sailed over on the Queen Mary and went through Ellis Island. I have obtain a copy of the 1940 U.S. Census and according to my grandparents, they were born in the “Free Republic of Ireland”. A few weeks ago, I attend an event at nearby St. Louis University. Daniel Mulhall, the current Ireland ambassador to the United States, gave a presentation. It helps a local lawyer, Kevin F. O’Malley, served as this nation ambassador to Ireland, during the Obama administration. Matt, this is super cool and a really informative post! I had previously read a bit about Italy and their process for allowing claims to citizenship based on grandparents. My grandmother is from Italy and my grandfather was Irish. This has made me even more curious to look further into their history and see if this something that I could do myself. Like you, I think it’s always great to have options, especially in this day and age in the world, and also, it’s pretty cool! Thanks for sharing your experience! The car cost 3.5 million dollars! How about a link to a secret agent watch AND maybe a secret encoder ring; plus a Land Rover thrown in for good measure. Well, the new Apple Watch has some pretty amazing abilities… heart rate monitor, walkie talkie mode, GPS, a personal assistant. Maybe that will do. I’ll just give Siri a British accent! Complete and easy to follow step-by-step instructions. I only wish I could use them to get my own Irish passport, but I have two Irish great-grandparents and zero Irish grandparents 🙁. Oh no! Just missed the cutoff. I believe great-grandparents only qualify if your parents went through the Foreign Birth Registry process themselves. I was just going to ask the same thing, darn it! Only great-grandparents for me.